The World Is Not Enough, and neither is this movie. 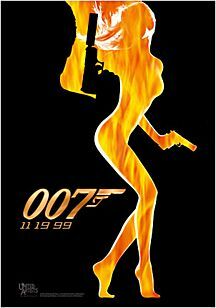 It looks like this one was another failed attempt to capitalize on the Bond popularity and loyal following. However, if MGM keeps putting out crap like this, there's not going to be much of that left to go around. And it's not like I don't like Pierce Brosnan as "Bond...James Bond." On the contrary, I think that he is one of the best 007s yet. 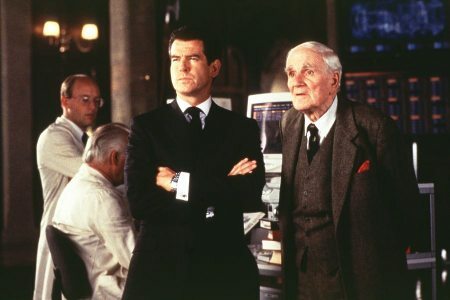 Furthermore, I absolutely loved the last Brosnan Bond: Tomorrow Never Dies. And to thicken the plot even more, he actually did a pretty good job with this latest flick. Then again, as one of my friends put it, anyone could have looked good while acting alongside Denise Richards (Wild Things). Actingwise that is (certainly not beautywise, for she is definitely a babe). In fact, Richards' terrible acting in this one make Brosnan seem almost worthy of an Oscar. Richards was absolutely horrible! And what is worse, her character was supposed to be (GET THIS!) a nuclear physicist! HAHAHAHAHA! HAHA! HAHAHAHAHAHA! HAHA! HAHAHAHAHAHAHAHAHAHAHA! HA! HA! HAHAHAHAHA! HAHA! HAHAHAHAHAHA! HAHAHAHAHAHAHAHAHAHAHAHAHA! HA! HA! HAHAHAHAHA! HAHA! HAHAHAHAHAHA! HAHAHAHAHAHA! HAHAHAHAHAHAHA! HA! HA! HAHAHAHAHA! HAHA! HAHAHAHAHAHA! HAHAHAHAHAHA! HAHAHAHAHAHAHA! HA! HA! HAHAHAHAHA! HAHA! HAHAHAHAHAHA! HAHAHAHAHAHAHAHAHAHA! HAHAHA! HA! HA! HAHAHAHAHA! HAHA! HAHAHAHAHAHA! HAHAHAHAHAHAHAHAHAHAHAHAHA! HA! HA! HAHAHAHAHA! HAHA! HAHAHAHAHAHA! HAHAHAHAHAHAHAHAHAHAHAHAHA! HA! HA! And quite truthfully, that really cuts to the heart of why this one doesn't add up to Tomorrow Never Dies: the supporting cast. The latter had the enormous help of Michelle Yeoh, who not only acted superbly, but also did her own stunts and fight scenes (what a woman!). This one had the, at best, laughable, and at worst, horrible, Denise Richards (but, as I mentioned before, she is a babe, so the pain is mitigated somewhat). On the other hand, brief stints of enjoyment can be received from Q (Desmond Llewelyn, pictured below) and his new assistant R (it was great to see the hilarious John Cleese). Sadly, however, their screen time lasted about 1 or 2 minutes. Digging deeper into the wound of bad performances was Sophie Marceau (pictured below, who also happens to be a babe). You may remember her from Braveheart as Princess Isabelle. In Braveheart, she was great. Perfect even. But as the oil tycoon heiress, Elektra King, she just plain embarrassed herself. But nothing can alienate an audience like a dumb plot. Not only was the main plot of this story dumb, but it was also extremely confusing. I would have to get a copy of the script and study it for a few months, creating graphs and charts to help untangle the ridiculous web of character and plot lines that it weaves. But that would, of course, be a silly waste of my brilliant mind and precious time. To sum it all up, here is how watching this movie will go for you. At first, the cool toys (a very acrobatic, Batman-like motor-boat; parachuting, snow-skiing, airplanish vehicles; etc. ), the beautiful women, and the fun of watching Brosnan be Bond will excite you and get you thinking that this is a good movie. But as you sit there, slowly the dumb and confusing plot will begin to wear you down. Then, bit by bit, the horrible acting will make you cringe and shift in your seat until you are almost to the point where you can't stand it anymore. Then, from out of nowhere, there will be a blatant (really blatant, by the way) sexual innuendo which will sort of get you to laugh or just plain groan at its corniness. Then it will all be over and you will leave the theater wondering at what you just experienced. Most likely, you'll be wondering why you just paid to see it. Big disappointment. I was hoping for more from Brosnan after the so-so The Thomas Crown Affair, but no! How would you rate the movie The World Is Not Enough? There have been 42228 people to visit this page since Fri, Nov 19, 1999. And you are the first person to visit this page today!